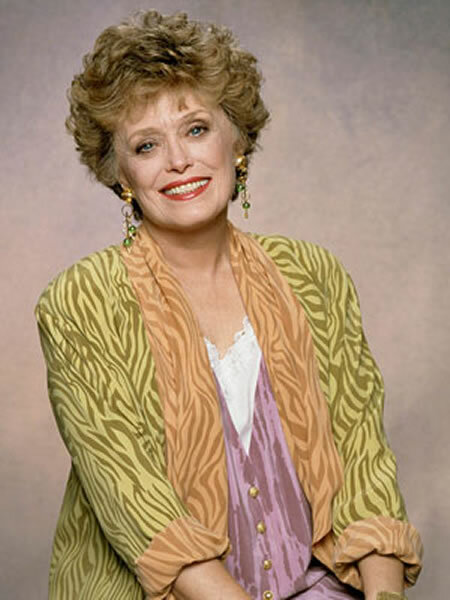 NEW YORK (AP) — Rue McClanahan, the Emmy-winning actress who brought the sexually liberated Southern belle Blanche Devereaux to life on the hit TV series “The Golden Girls,” has died. She was 76. The grave of Golden Girl, Estelle Getty, is finally marked! Thanks Louis for the heads-up! It’s been a little over a year since comedian Estelle Getty died and it appears that she is finally getting a marker on her grave at Hollywood Forever Cemetery. Getty, who died on July 22, 2008 is best known as the cranky but lovable, Sophia Petrillo on the classic NBC sit0com, The Golden Girls. The cement base for the marker was being poured today. According to cemetery employees, the marker may be completed within two weeks or perhaps sooner. Rest in Peace Estelle! The noted Broadway actress and TV star known for her sharp-tongued characters died of cancer at her home in Los Angeles. Just a few of the stars who passed away last year that were not mentioned in last evenings Academy Award ceremony. LOS ANGELES (AP) — Estelle Getty always liked a bargain. Despite her sitcom success with The Golden Girls, son Carl Gettleman told friends and family gathered at a private memorial service Thursday that his mother always chose frugal over flashy. He recounted a time when his Emmy-winning mother’s Toyota Tercel was towed out of her assigned parking space at The Golden Girls production lot because security thought someone else had parked there. “The Great Depression left an indelible impression on mom,” Gettleman said. Getty, who suffered from advanced dementia, died Tuesday at her Hollywood Boulevard home. She was 84. The diminutive actress was best known for her role as wisecracking Sophia Petrillo on The Golden Girls, which ran from 1985 to 1992 on NBC. When she auditioned for the show, Getty was appearing on stage as the carping Jewish mother in Harvey Fierstein’s play Torch Song Trilogy in Hollywood. After her success in The Golden Girls, other roles came her way. She played Cher’s mother in Mask, Sylvester Stallone’s in Stop or My Mom Will Shoot and Barry Manilow’s in the TV film Copacabana. She also played the feisty department store owner in Mannequin and voiced the character Grandma Estelle in Stuart Little on the big screen. Other speakers at the funeral included Getty’s other son Barry, her longtime assistant Richard and Golden Girls executive producer Tony Thomas. Her Golden Girls co-stars Bea Arthur, Rue McClanahan and Betty White were not in attendance at the intimate service inside the chapel at the Hollywood Forever Cemetery in Los Angeles. Estelle Getty, the diminutive actress who spent 40 years struggling for success before landing a role of a lifetime in 1985 as the sarcastic octogenarian Sophia on TV’s The Golden Girls, has died. She was 84. The Golden Girls, featuring four female retirees sharing a house in Miami, grew out of NBC programming chief Brandon Tartikoff’s belief that television was ignoring its older viewers. Three of its stars had already appeared in previous series: Bea Arthur in Maude, Betty White in The Mary Tyler Moore Show and Rue McClanahan in Mama’s Family. The last character to be cast was Sophia Petrillo, the feisty 80-something mother of Arthur’s character. When she auditioned, Getty was appearing on stage in Hollywood as the carping Jewish mother in Harvey Fierstein’s play Torch Song Trilogy. In her early 60s, she flunked her Golden Girls test twice because it was believed she didn’t look old enough to play 80. It culminated a long struggle for success during which Getty worked low-paying office jobs to help support her family while she tried to make it as a stage actress. “I knew I could be seduced by success in another field, so I’d say, ‘Don’t promote me, please,'” she recalled. She also appeared in small parts in a handful of films and TV movies during that time, including Tootsie, Deadly Force and Victims for Victims: The Theresa Saldana Story. After her success in The Golden Girls, other roles came her way. She played Cher’s mother in Mask, Sylvester Stallone’s in Stop or My Mom Will Shoot and Barry Manilow’s in the TV film Copacabana. Other credits included Mannequin and Stuart Little (as the voice of Grandma Estelle). The Golden Girls, which ran from 1985 to 1992, was an immediate hit, and Sophia, who began as a minor character, soon evolved into a major one. Getty had gained a knack for one-liners in her late teens when she did standup comedy at a Catskills hotel. Female comedians were rare in those days, however, and she bombed. Undeterred, she continued to pursue a career in entertainment, and while her parents were encouraging, her father also insisted that she learn office skills so she would have something to fall back on. Born Estelle Scher to Polish immigrants in New York, Getty fell in love with theater when she saw a vaudeville show at age 4. She married New York businessman Arthur Gettleman (the source of her stage name) in 1947, and they had two sons, Carl and Barry. The marriage prevailed despite her long absences on the road and in The Golden Girls.